As marketers become more reliant on their tech stack to ensure efficiency, help them be data-led, and take over some of the heavy-lifting and repetitive day-to-day tasks, the choice of available marketing providers has skyrocketed. 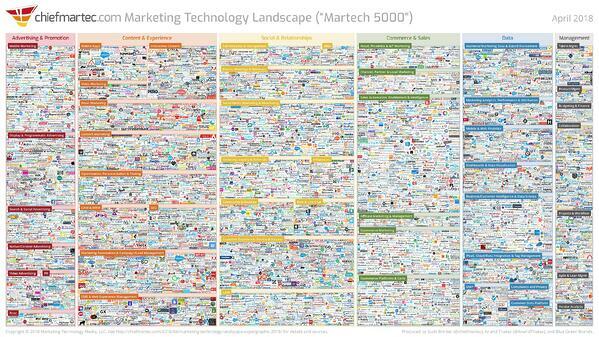 Ever cast your eye across Scott Brinker’s Martech Landscape? When it started out in 2011 there were a casual 150 providers on it - a figure that has ballooned to nearly 7000 this year. As a marketer, the prospect of keeping track of this burgeoning landscape of solutions may be giving you palpitations. Instead of grabbing your magnifying glass to check out the endless possibilities in the infographic above, how about hearing us out on something we think is going to be big in the future of martech: verticalisation. What on earth is verticalisation? Yes, we know, another new buzzword for your marketing arsenal but stick with us. We promise that this is going to land somewhere impactful. Many technologies out there are built to serve multiple verticals (banking and finance, travel, services, charities… the list goes on). This tech traditionally centres on a common task, for example, sending an email to a list of people, for example with traditional email service providers. The rising tide of customer expectations are set to shake this all up. As marketing becomes more data-driven and personalised and moves away from a batch-and-blast, one-size-fits-all approach, marketers will need tools that solve the specific use cases of the vertical they’re working in (in our case, retail). After all, the banking customer journey looks very different to a retail one. And that’s where we arrive at ‘verticalisation’ - the phenomenon of technologies springing up to solve the pain points of specific industries. This post will discuss some of the ways that ecommerce marketers stand to benefit from using retail-specific marketing solutions. Customers’ expectations are already surpassing ‘F|NAME’ in the email greeting. To support these new expectations around personalisation, it’s essential for every retailer to truly understand their customer and their habits shopping online with them. And to understand your customer, you need a marketing provider that truly ‘gets’ the intricacies of the online retail customer journey. Working with providers (such as traditional ESPs) that serve multiple verticals takes away the from the provider’s ability to focus on creating innovative functionality that solves very specific, and often complex, retail use cases. Will they be able to provide some of the basic functionality that you need? Absolutely. But will they have your particular pain-points as a primary focus? Bear in mind the needs of your shoppers; ensuring the delicate balance of an enjoyable customer journey that also maximises engagement across the various touchpoints? Ecommerce involves very specific structures, whether that be product taxonomy, categories, line items, product attributes, returns and the like. And although a more general marketing provider may be able to provide functionality that assists in with this is a more general sense, a true understanding of execution, insight and innovation - to match the highly personalised experience customers have come to expect - may not be doable. An example of this would be recommending products or taste profiling your customers to offer better personalisation. This means that the platform you choose as your provider needs to be able to take into account all these important elements - specific products, the frequency at which the customer purchases or looks at those products and their general shopping habits - to offer relevant personalisation, enabling you to execute advanced level campaigns to truly set yourself apart from other retailers. Another example is product-related triggers that are unique to ecommerce, such as replenishment campaigns. Replenishment campaigns are triggered when a customer who has purchased a perishable item in the past, like mascara, is due to need a replenishing of that item. In this example, the replenishment campaign may occur once every three months, taking into account the average repurchase times of customers. This, of course, would change depending on the item. Any type of campaign based on complex product attributes would be incredibly difficult to set up well in a non-retail specific platform. This type of campaign is unique to retail and would require a provider (preferably using machine learning) that can understand and continuously learn about factors relating to individual products, such as volumes, if it was previously purchased as part of a multi-pack or single, how perishable this item is, the average time customers usually spend before they purchase this item and other items that are usually bought in conjunction with it - therefore creating opportunities to upsell. 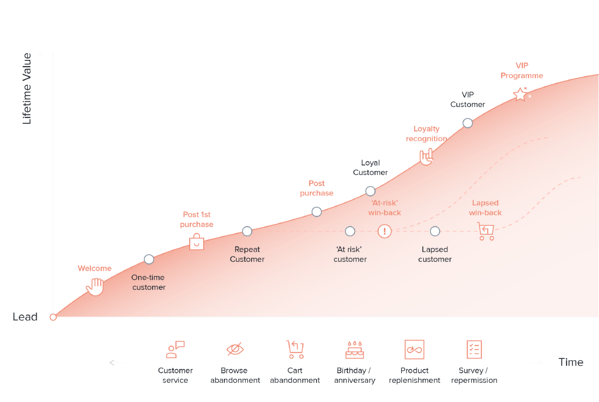 Every vertical has its own unique customer journey and retail is in no way exempt from this. From leads to first-time purchasers; loyal shoppers to lapsed ones, its important to use a provider that takes into account the unique journey of its customers. For example, the online customer journey a shopper purchasing a mattress, which may happen only once every 36 - 60 months, will differ completely from an online shopper purchasing jewellery, which may happen every 1 - 6 months. This highlights that within the vertical itself, there is still a further layer of complexity that requires a marketing provider with retail needs as its sole focus. As AI and complex machine learning become more incorporated into retention marketing solutions (operating in the background much like an assistant), it will also become more imperative that your tech is specialised to suit your needs. You can’t build a catch-all algorithm and expect it to be able to solve or learn to solve your vertical-specific pain-points. Much like with visiting a doctor, there are specialists who have expertise knowledge with specific parts of the human body. If your issue is very specific, you’d likely end up seeing a specialist rather than a general practitioner who, because of their specific focus, will be able to spot irregularities more easily and treat you more efficiently. AI is much the same: if vertical specific, algorithms can take into account things such as product taxonomy and learn how to best process this data to make your campaigns more timely and personalised - which makes your workload lighter. Although you will still find expertise in a cross-vertical solution provider, you want to be sure that every touchpoint within the provider’s organisation - whether that’s the salesperson who sells you the solution, the support staff you raise any issues with or the customer success manager who ensures you’re getting the most out of the platform - to have an expert knowledge of your specific pain-points as a retail marketer, and can help you fix them. As with the medical analogy used previously, when you’re buying a marketing platform, it’s important that the salesperson you’re speaking with has a deep understanding of your specific pain-points and goals as a retail marketer. If not, you may end up being sold something that doesn’t make your life easier and customer experience better. Similar can be said of the customer success and support teams who you will be speaking with on a regular basis. Both teams should be able to offer best-practice expertise and show you examples of how campaigns have been executed successfully before, as well as being able to benchmark your performance against others in your space. As with any product, as the needs of their clients grow, so will the capabilities and features. If you are using a one-size-fits-all platform, you can never be sure that that provider won’t stop focusing on creating innovative features for your vertical in favour of another. The direction your marketing solution should be going in should always be retail-specific. This way, you can be rest-assured that any changes made will be for the benefit of you and your brand - not to fulfil the needs of a differing vertical, negatively impacting the quality of messaging you send out to your customers. Their dedication, alongside yours, should be laser-focused in improving the retail customer experience. Specificity is the key for martech success. As the needs of retail customers, and you their marketers, continues to shift and grow you need to ensure you have a provider who is innovating to meet these needs without distraction. From features to customer lifecycle and roadmap, retail needs to be at the forefront of your providers mind and this will reflect in both the functionality and strategy you are provided with.